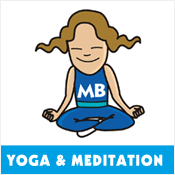 Kid's Yoga & Meditation Classes North Shore. Moving Bodies Centre. Moving Bodies have invited Fiona Borland (primary school teacher) and Vicki O’Leary (Reiki teacher and practitioner) to facilitate a workshop for children aged 5 – 12 years which will provide simple tools to help with anxiety, building confidence and understanding emotions. Fiona and Vicki have been facilitating meditation class for a number of years, including Intuitive Kids workshops and meditation / relaxation classes for children and adults. The Meditation / Relaxation and Yoga Workshop for Children aims to build a healthy body and mind through increased body awareness, children’s yoga and simple meditation techniques. Children will learn how to use their breath to remain calm in stressful situations, muscle relaxation (great to help with sleep), and affirmations / visualisations for building self esteem. Other activities will include intuitive drawing and mandalas. Commencing Wednesday 28 February and running for 7 weeks til Wednesday 11 April. We are also one of the North Shore’s biggest kid’s birthday party venues specialising in gymnastics parties. Our indoor play centre incorporates two areas catering for children from 0-2 years of age and 3-11 years of age. It is also the perfect all-weather venue for indoor kids birthday parties. In 2018 our exciting Ninja course will open and be available for kids Ninja parties from April. Alternatively, our mobile birthday party equipment is available for hire and we can delivery to your home or birthday party venue. At our brand new indoor parkour centre we offer kids parkour classes from ages 5+ form beginners to advanced. Our parkour course is open to adults and for kid’s parkour parties (coming soon) and features a variety of different levels of obstacles that you can jump, climb, swing, hang, roll and more! A spider wall, climbing wall, a peg wall plus 4 warped walls are all part of our parkour area!